Motorists should dust off their "Off Broadway" detour routes as the state's largest interstate work zone will launch this month at the I-235 and I-44 interchange in Oklahoma City. The Oklahoma Department of Transportation is encouraging drivers to avoid the area during the nearly two-year project. This project, starting March 25, will bring a more than decade-long modernization effort almost to completion with a seventh and final phase scheduled for award in 2020. Together, these final projects will complete the widening of I-235/U.S.-77/Broadway Ext. up to eight lanes between Edmond and downtown Oklahoma City. "This is likely to be the most disruptive to traffic of any other project in the state," said Terri Angier, ODOT spokeswoman. "The project will eliminate the last remaining bottleneck for traffic by widening I-235 over I-44 and it will be the first four-level interchange built on the state highway system in Oklahoma." There are 11 bridges within this project, which includes building two new flyover ramps to move traffic more efficiently from northbound I-235 to westbound I-44 and from eastbound I-44 to northbound I-235/U.S.-77/Broadway Ext. Separating these two movements from mainline I-235 will help eliminate existing conflict points and will allow for the removal of the two clover leaf ramps on the east side of the project. The tallest flyover ramp will be 70 ft. in height, making the interchange similar to one at the John Kilpatrick Turnpike and SH-74 in north Oklahoma City. an up to two-week closure of the southbound I-235/U.S.-77 off-ramp to eastbound I-44 and the westbound I-44 on-ramp to southbound I-235 while these two clover leaf ramps are widened and improved. The northbound I-235 on-ramp from N. 50th Street is permanently closed to make room for the eastbound I-44 flyover ramp to northbound U.S.-77/Broadway Ext. With this widening project, motorists will have up to eight lanes between Edmond and downtown Oklahoma City to better handle the nearly 100,000 vehicles a day, on average, traveling the corridor. An equal number of vehicles travel I-44 in this area. 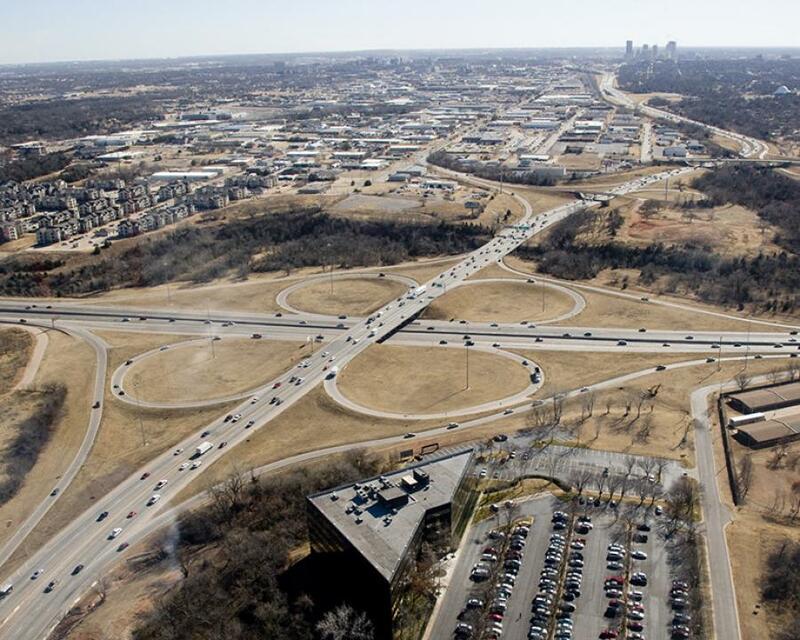 Allen Contracting Inc. of Oklahoma City was awarded the $105 million contract in December 2018, making this the largest single dollar amount contract in state highway history to date. The contractor will bring back nationally known bridge experts American Bridge Co. Inc. to erect the two flyover ramp bridges. American Bridge successfully completed the installation of the new BNSF railroad bridge over I-235 in early 2018 where the 2-million-lb. each truss structures were rolled nearly a quarter of a mile into place. "This area will have intense activity in all four quadrants of the project right from the start. We cannot emphasize enough that even with few actual lane impacts at the beginning of the project, motorists still will experience significant delays and congestion within the work zone," Angier said. "It will be extremely important to use the department's traffic tools such as oktraffic.org and the new ODOT app to plan ahead and know your alternate routes before heading to this area of Oklahoma City." Motorists should stay off Broadway and use alternate routes such as I-35, SH-74/Lake Hefner Parkway, I-44, I-40 and Lincoln Blvd. Drivers can stay connected for traffic updates and closures by signing up for the daily OKC Traffic Advisory at odot.org and following @OKDOT on Twitter and Facebook. 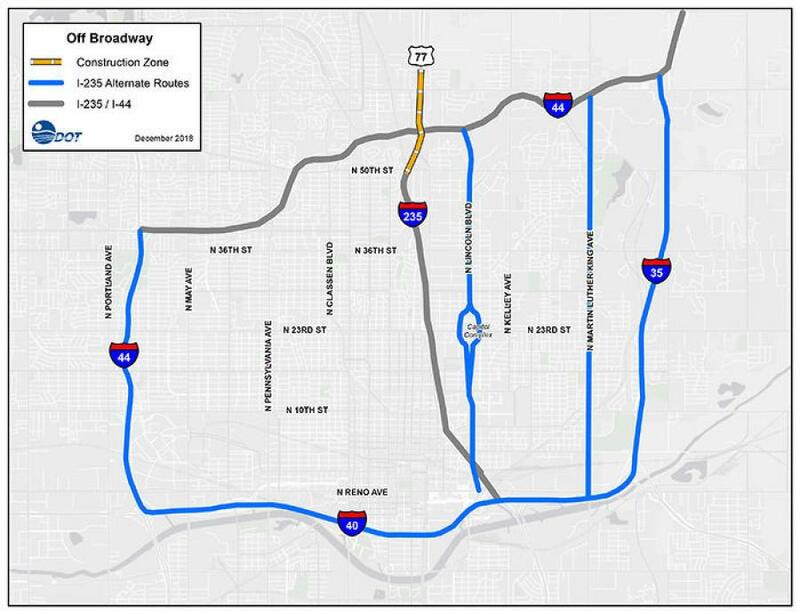 The final and seventh act of the Off Broadway I-235 corridor widening is scheduled for award in 2020 to reconstruct westbound I-44 to northbound U.S.-77/Broadway Ext. ramp at an estimated $16 million. That phase also will create a direct connection from N. Lincoln Boulevard to northbound U.S.-77/Broadway Ext. Once all seven phases are complete, this will represent a nearly $300 million investment in highway infrastructure in the Oklahoma City area.